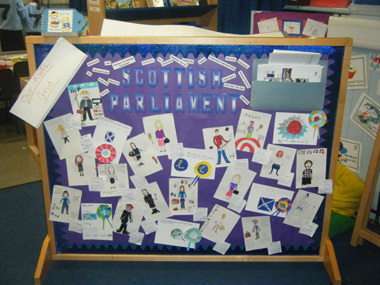 This Storyline was designed as a study of the Scottish Parliament. The plan was that the pupils would use their existing knowledge of the parliamentary system and learn more within a structured role-play activity. They would look at what the parliament does, how it is run and how elections work. As a culminating event we would make a visit to Holyrood and benefit from the ‘parliament outreach’ visiting the school. The aims of this study include learning to investigate the features of an election and the work of representatives at a local, national and European level in order to develop a deeper understanding of how democracy works.